Cambridge Audio updates TV2 and TV5 soundbases | What Hi-Fi? 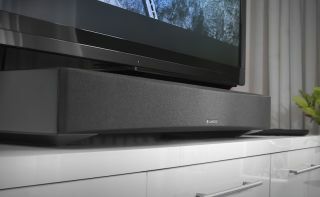 Among the new features are an improved DSP, increased power outputs, and new enclosures – and the TV5 now has a subwoofer. Cambridge Audio's TV2 and TV5 soundbases are getting some upgrades. Both now include HDMI connectivity and sport an improved digital signal processor (DSP) in an effort to reduce distortion and improve processing. This promises to give "music or movie tracks a louder, crisper and fuller sound." The soundbases will come with a redesigned learning remote control, allowing you to adjust the volume on compatible systems, such as Sky Q. The power output has been doubled compared to the previous models, and their power supplies have been moved inside a new "seamless" enclosure. There are also more drivers for your dosh; the new TV2 now has twin bass ports, while the TV5 has been given a second subwoofer. Both still support wireless Bluetooth, use BMR drivers, and have digital optical, RCA and 3.5mm connections. The new Cambridge Audio TV2 and TV5 will be priced at £200 and £300, respectively, and will be available in October.